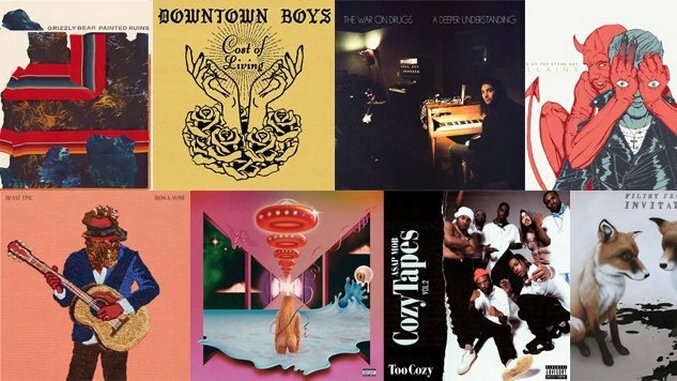 A quick poll of Paste’s staff and interns regarding our most anticipated albums for this month initially yielded responses as tepid as the humid August air after a thunderstorm. But after clearing our senses, we actually remembered a slew of bands whose newest efforts are making us giddy. From surf rock to Norwegian pop, from Kesha’s grand return to our Paste Quarterly cover boys Grizzly Bear, here are 15 albums Paste is most excited to hear in August 2017. This Providence-based punk band signed with the venerable Sub Pop for their third album, Cost of Living. Frontwoman Victoria Ruiz and the rest of the band aren’t shy calling out the absurdity of today’s politics, so maybe this will be the album of protest songs we need and deserve. This has been one of the most anticipated rap albums of the whole year. Having worked with electronic artists like Flying Lotus to indie rock bands like Future Islands, Rory “Milo” Ferreira’s follow up to 2015’s So the Flies Don’t Come is sure to showcase his engaging style of progressive hip-hop. Funky falsetto-heavy electro-pop band Everything Everything returns with their fourth LP. Based on lead single “Can’t Do,” the Manchester band might have made a soundtrack for a fever dream after all. Read the rest of Paste’s cover story on Grizzly Bear’s return here. This post-punk band is kind of a big deal in their native Australia. Although their 2015 single “Life As A Gun” made waves internationally, Drum might help them level up in the States. Although members (A$AP Rocky, A$AP Ferg, A$AP Twelvyy) of this hip-hop collective have released solo singles, EPs and albums recently, the band gets back together for their second joint release, Cozy Tapes Vol. 2: Too Cozy, just a year after their debut. Filthy Friends is the new band featuring Corin Tucker from Sleater Kinney and Peter Buck from R.E.M. The supergroup has been likened to T. Rex and The Replacements, so we’re excited to see what kind of rock they conjure on their debut. After collaborations with Band of Horses’s Ben Bridwell and Jesca Hoop, as well as a string of more experimental Iron & Wine LPs, Sam Beam returns to his warm acoustic roots on Beast Epic and we can’t wait. Liars is not the same band it was. In 2014, Julian Gross left the band and in earlier this year, co-founder and multi-instrumentalist Aaron Hemphill announced he was leaving. As a result, we’re not entirely sure what to expect from TFCF, but that doesn’t mean we’re not curious.